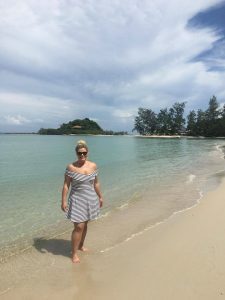 “In November I was lucky enough to go on my first trip to Asia and visit the wonderful country of Thailand on a multi destination work trip hosted by Travel2/Gold Medal. 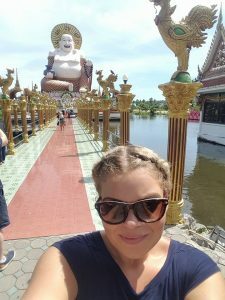 My Thailand adventure started with an easy 12 hour flight with EVA Air direct from London Heathrow to Bangkok. I must say I was impressed with the seat pitch and comfort of the EVA air seats, they have seat back entertainments packages (although limited choices) and the food had an oriental twist on board – maybe not for all tastes but I couldn’t fault the service and quality in their economy class. In Bangkok we took a connecting Bangkok Airways internal flight to Koh Samui, and whilst waiting we were able to wait in the Bangkok Airways passenger lounge which all passengers have access to travelling with Bangkok Airways. Here you have access to complimentary snacks, tea, coffee & water. I was very impressed with the Bangkok Airways flight . Just a 1 hour flight but we were offered a hot meal service with a soft drink, all very quick and efficient. Landing into Koh Samui was a real treat as we were met from the plane by passenger trolley ‘tuk tuk’s’ which made you realise you really were in Thailand and was the start of the adventure! Koh Samui airport is probably the quaintest and cutest airport I have been to. It is open air with raffia furniture and décor. Koh Samui has recently increased in popularity and is becoming one of Thailands leading beach island destinations, but has still has managed to retain its laid-back charm and beauty that made it popular in the first place. You’ll find a variety of beaches here, each with their own restaurants and resorts, catering for most tastes and budget. The island is quite compact and has a concentration of resorts on the east coast which means that you are roughly never more than 20 to 25 minutes away from any point of interest. Weather – it is always warm with averages of 28 – 32 degrees year round, however rainfall differs with the wetter season being October to March and the drier season April to July. However I went in November and didn’t see any rain and saw sunshine every day! 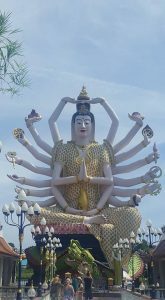 We stayed in two hotels on Koh Samui, both 5* and offered great hospitality & service. The first was the SALA Samui Choengmon Beach Resort. 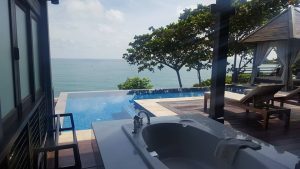 This is a Modern Thai hotel with an international twist located on Choeng Mon beach in the northeast corner of Koh Samui Island. It is within strolling distance on the beach to a few little bars and restaurants. A comfortable, relaxing atmosphere has been created here and has all modern facilities and amenities you would need. The accommodation is beautiful and the majority of the 69 rooms offer private pools and outdoor bathrooms under canopy. The food was excellent, with an A’ la carte Thai menu and their breakfasts are something special with lots of choice. I highly recommend the avocado and smoked salmon special – amazing! The second hotel on Koh Samui was the Tongsai Bay Hotel. The property is set in 25 acres of tropical gardens with a lovely beach, sloping lawns and giant palm trees giving it a truly tropical feel. The Villas and Suites are furnished with beautiful hardwood floors, terraces and open-air bathtubs. A lot of the 83 rooms have private pools as well and larger villas 1 or 2 bedroom to accommodate larger groups or families easily. They have a tranquil and relaxing Spa called Prana. I was lucky enough to be given the Mcguigan Cottage to stay in which was just beautiful and had a four poster bed, private pool, outside bath & Balinese bed and a beautiful view over the resort, beach and sea. I was truly spoilt and very lucky! On the island itself Choengmon beach is very relaxed. The busier and main area of Chaweng has an abundance of shops, stalls, restaurants & bars and is busy day and night. This area is for people wanting a livelier holiday but only 15 minutes by taxi from both hotels on the island. We went to the fishermans village of Bo Put (20 minutes taxi) which was lovely. It has nice restaurants and bars, and we went to the famous CoCo Tams and watched their amazing fire show. WOW – a definite must see! Then it was on to our 2nd island Koh Phangan which we got to and from by speed boat and took us approx. 30 minutes (varies from 20 to 90 minutes depending where you go from). It was an easy crossing with views of the ocean and the islands. Koh Phangan has been known in the past as the backpacker’s paradise. It offers a mix of secluded sandy beaches, deep waters ideal for divers and its famed Full Moon Parties and now also Half Moon Parties. It’s tropical coves make it a great place for exploring or relaxing. Our first port of call was the Santhiya Resort & Spa which is a 4* property located among 18 acres of tropical grounds on it’s own private bay. It had a bit of a ‘castaway’ feeling and offers lovely views being built into the cliff side. It is a Thai style resort with a traditional feel in style with dark teak wood furniture and embroidered colourful throws. It has 99 rooms, some villas with private pool and 2 bedrooms for families or groups. On our evening here we were treated to a traditional Thai dancing show. Next stop on Koh Phangan was just a short 10 minute journey to my favourite hotel on the trip the Anantara Rasanada Koh Phangan Villas. It is placed between the base of a mountain and the sea giving it a quiet and laid back feel. It has 44 villas and suites most with own private pool. It was so relaxing and the perfect place to spend some time relaxing. With many restaurants and bars within an easy beach stroll and also a little town just out the front door of the hotel it is easy to explore from the property. Their beach restaurant is open for all meals so you can feel the sand between your toes if you wish! This place was heaven and the Thai hospitality was hard to beat. Again I was lucky enough to stay in a Private beach front villa with private pool that you could access the beach from and straight into the sea. A real treat indeed. After our 4 nights on the islands it was back to Koh Samui airport and another easy, short flight with Bangkok Airways to Bangkok and onto our 2 nights in the capital city. Bangkok is known as one of the world’s great cities and was an exciting experience. It buzzes with activity both day and night and has a constant bustle, and a little chaos thrown in as well! We went on a river boat cruise down the Chao Phraya River to see the skyline and sites of the city – a nice way to see it. A key feature of the city is the nightlife, the main area being the open air markets on famous streets such as Khao San Road and Patpong. It is a must if you are shopper and after some bargains! I stayed at the 4* contemporary LIT hotel with all facilities needed for the modern traveler – gym, spa and good restaurant. It is in the Pathumwan district so away from the main roads & areas stated above but only a 2 minute walk to the Sky Train National Stadium Station and the huge MBK Shopping centre which is a shoppers dream!. Error: Error validating access token: Session has expired on Monday, 01-Apr-19 06:23:33 PDT. 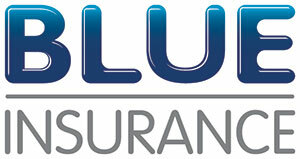 The current time is Thursday, 25-Apr-19 23:37:56 PDT.